When it comes to modern IT workloads, SAP environments top several different lists. Not only does SAP rank as one of the most complex and diverse workloads, but it’s also undoubtedly the most important to day-to-day business operations. And like most IT workloads ensuring bulletproof resiliency on top of high-performance is a responsibility that falls on the shoulders of its supporting infrastructure. 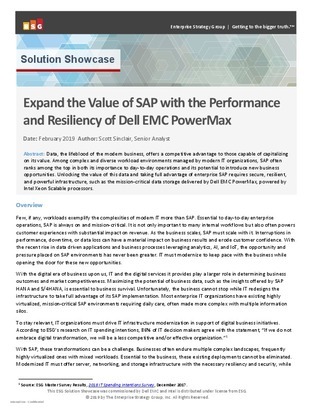 Inside, learn about the latest suite of PowerMax data storage arrays from Dell EMC, designed specifically to sustain massive SAP and SAP HANA workload demands. Download this white paper to learn more about Dell EMC Ready Solutions for SAP HANA, powered by Intel® Technology.